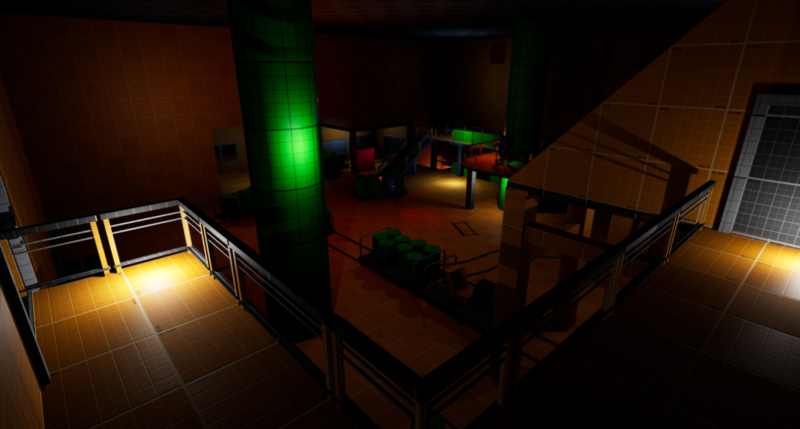 Tasked to infiltrate a top secret laboratory, you must either sneak or fight your way through to steal the antidote and get out alive. Filled with interactive elements, hidden passages, and support for multiple ways to play, this level is sure to provide surprises each time you play! 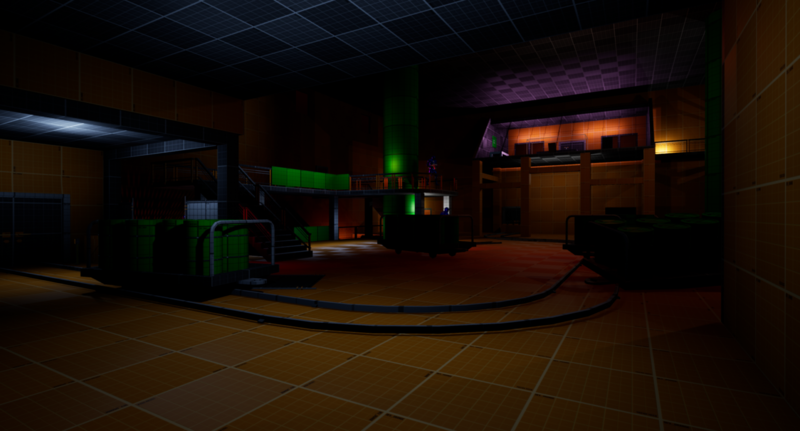 My initial plan for this level was to have a sort of ” hub and spoke” where the player would return to throughout game play. Given my brief, this turned out to not go well together. Given that there was only one objective and no place to turn it in, a hub would have been useless. After initially blocking out a small part of that hub level, I decided to go back to the drawing board and came up with the sketch shown at the side. Given that this brief was based on some fictional movie characters, I wanted the level to feel cinematic and be somewhat linear without the elements being spoon fed to the player. 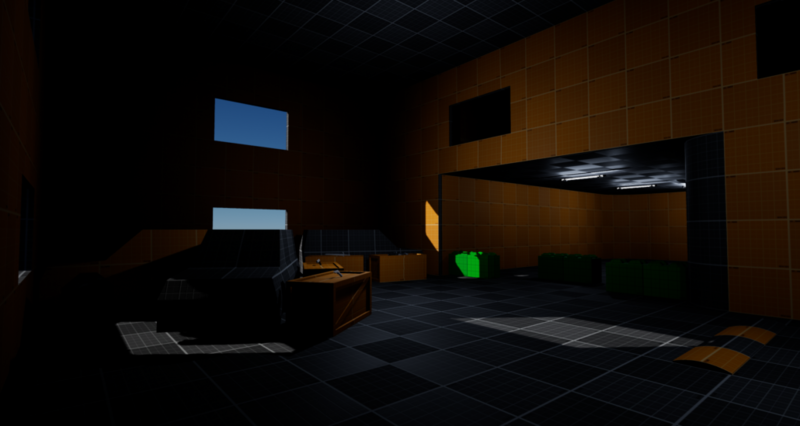 Although I do not have any voice overs, I had planned to incorporate that into the level as a way for the player to see what is ahead and what their main objective is without having some sort of objective text or menu for them to look at. 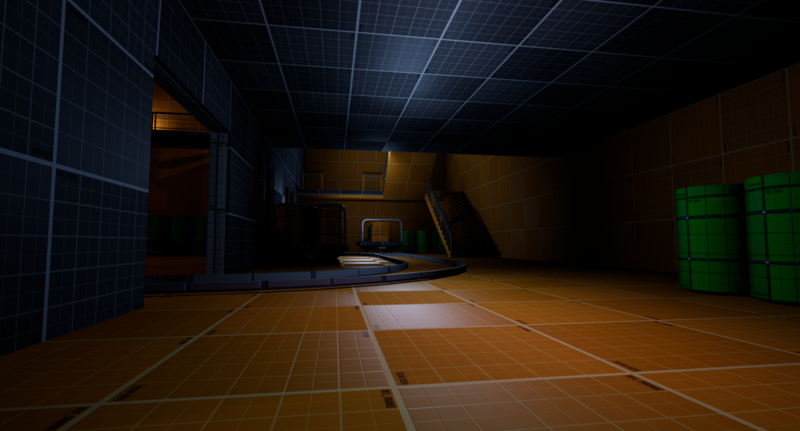 This way, they are completely immersed in the level and feel like they are an agent trying to infiltrate a secret lab. My idea for this level was to let the player have fun. I consulted a few friends and asked them why they played the games they did. To summarize their responses, they liked to have a choice in how to beat a level. They weren’t spoon fed how to play a certain way and felt their like choices mattered in how they played. 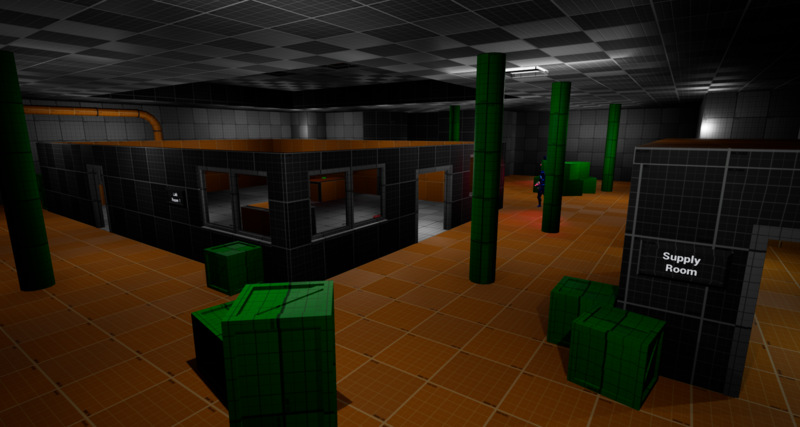 Although there is lots of combat in the middle of the level, each beat can be bypassed through stealth. Players do not have to fight and can beat the level without having to shoot a gun. All of this tension slowly builds up over the course of the first half and is finally released after constructing the antidote when Dr. Evil releases all of his zombies and starts the self destruct timer. 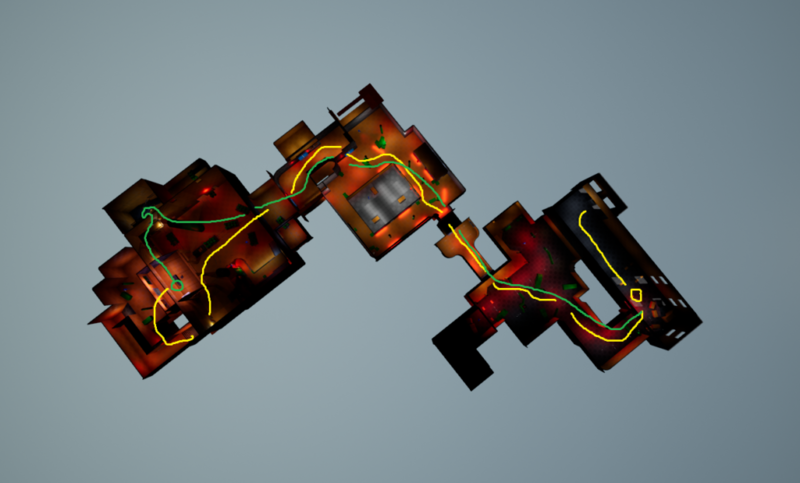 I did not want this level to be so linear that the player gets bored while playing. I wanted them to choose where to go and have it make an effect on the outcome. If they only take a melee weapon and a pistol at the start, they may want to use the paths with more cover since their weapons are not powerful to fight many enemies. On the other hand, if they take the shotgun or rifle, they may just want to burst in guns blazing. Many people I have talked to like games in which they can choose how to approach beating a level. With that information in mind, I wanted to make sure I support that playstyle. 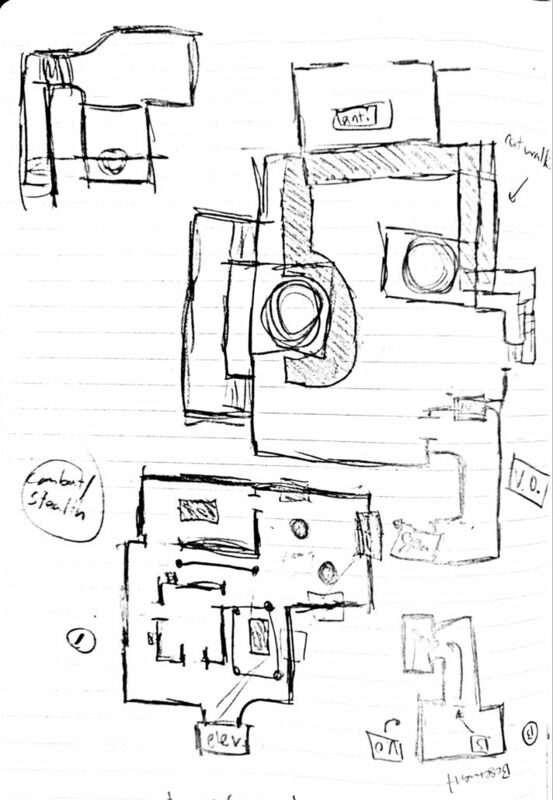 In the image, I drew out all of the possible routes the player can take to get to the raised office room. 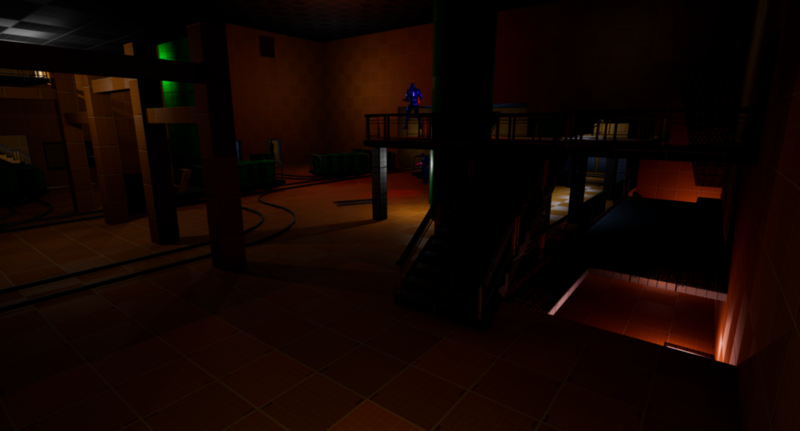 The center of the room can be considered “no mans land,” where they player will most likely be seen and shot from the enemies. If they notice that, they will look around and see that there are flanking routes where some have more cover than others. 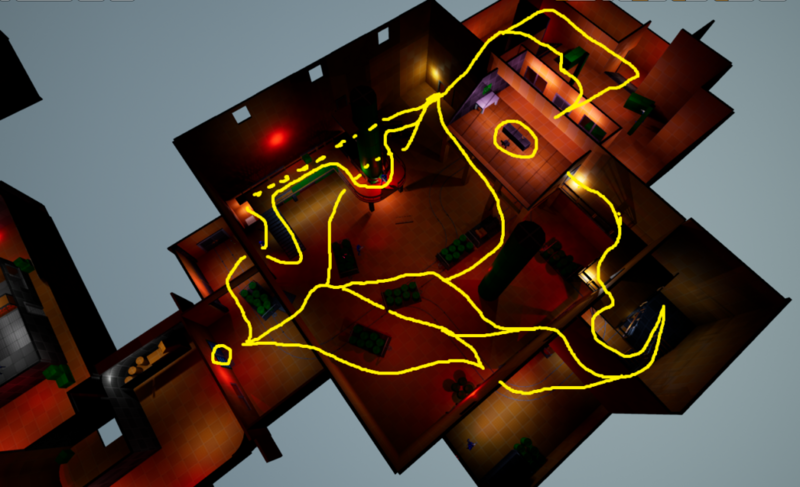 Using those routes, they can either sneak past the AI or have the jump on them so they can kill the AI before they get shot at. *Note: Each of these blueporints can be seen in the level itself or by clicking on the item to view the code itself. 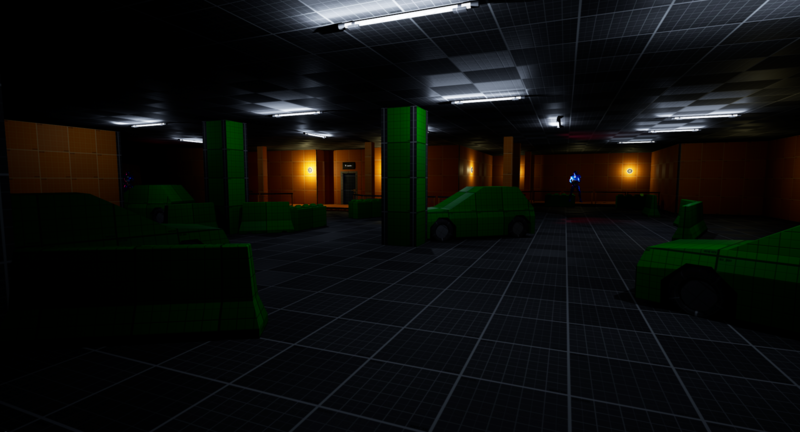 Apart from the generic moving from cover to cover and shooting enemies, I wanted to give the players a reason to explore each room and not just rush through the game. The pickups is apart of this and also connects quite well with the theme and objective of the level. 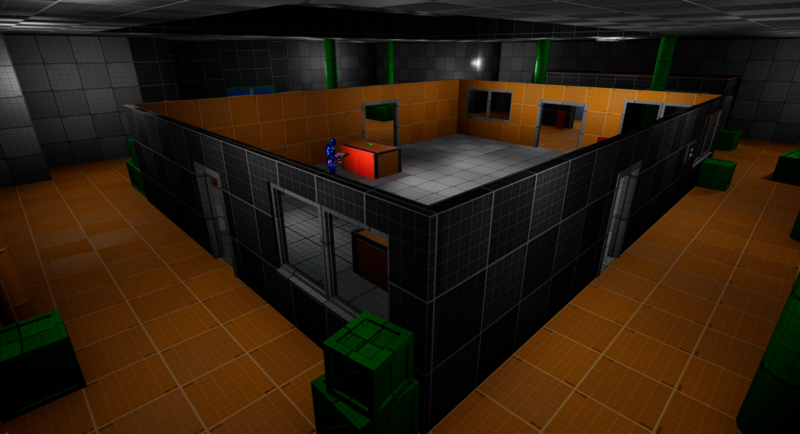 The beginning of the level slowly starts ramping up this pressure with all of the enemies and sneaking around. This finally releases when Dr. Evil notices that you took his antidote and presses the self-destruct button, forcing you to run out of the lab and escape. Not only do you have to escape, but he places a bunch of zombies in your path as a way to block your exit. This was as simple as getting all references of the AI, removing them, and looping through an array of target points and spawning a zombie on each of them. You can see this in action on the video on the right.